Things change, products evolve, the industry is no different. In the past, we have relied on wax and sealant to protect our automotive paint. The durability of those products, however, can only be measured in months. Pioneered by CQuartz, 9H eramic professional coatings have changed the way we protect our car's paint, with durability that is measured in years; it’s easy to see why these products have become the go to paint protection solution in Dallas & Fort Worth and maintaining your vehicle has never been easier, and the brand new shine of your paint is preserved for years - yes years. Ceramic coatings are a great compliment to our Xpel paint protection film service. 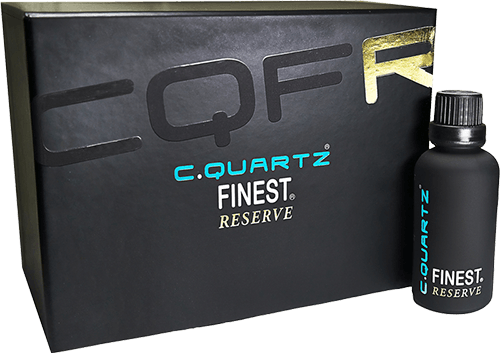 Our ceramic coatings of choice are CQuartz Professional and CQuartz Finest Reserve. CQuartz car coatings are the most exclusive on the market, for a multitude of reasons. Not just anyone can get their hands on these ceramic coatings, less than 1% of applicants succeed in getting the CQuartz Finest Certification to install them. The stringent certification process guarantees each installer is not only skilled and experienced but honest and provides first class customer service to his clients even after installation. The Best CQuartz Ceramic Professional Coatings Yet! We are amongst of the 1% of detailers who passed the stringent CQuartz Certification process. We can appreciate that CQuartz value the quality of their ceramic glass coatings so much that they only allow the best to install them. CQuartz understands that the installation process is an important factor in the longevity and performance of ceramic car coatings, incorrect installation will results in lower performance and faster degradation of the coating as the nano glass coating didn't correclty bond to the paint during installation. Our installation process follows the latest and most rigorous protocols to guarantee a perfect bond between your car's and CQuartz coatings to deliver unmatched auto paint protection near you in Dallas & Fort Worth at a competitive cost. The dirt repellency and stain resistance of CQuartz Ceramic Coatings makes it an absolute dream to keep clean. Since the coating is so much stronger than a wax/sealant, debris (brake dust/tar/bird etchings) has a much harder time sticking to the paint. This is the main reason why the vehicle is so easy to maintain/clean, water simply beads up and runs of the surface. No more constant wiping and digging to get embedded dirt out of the car, which means less scratching of the paint. With CQuartz Professional the paint will not dull or oxidize, surfaces stay cleaner and glossier, and clean up easier! Water spots can be a challenge for other products In the ceramic coating industry, but no durable ceramic coating is able to resist natural water stains better than CQuartz’ line of Professional coatings. CQuartz Professional also resists bird and bug stains, and a variety of environmental fallout! Properly maintained, CQuartz Professional will last for years, all while keeping your car glossier, cleaner, and easier to wash and dry! CQuartz Professional harnesses the power of advanced nanotechnology. Each silica (quartz) atom has multiple fluorocarbon molecular bonds, which create a high-density 3D structural coating matrix. Once bonded to the surface of your paint, CQuartz Professional not only protects the gloss and depth created by your professionally accredited CarPro installer, it actually enhances it! Once cured, CQuartz Professional forms a dense, durable coating that protects the paint and retains a high gloss for years to come! Learn more. Finest Reserve provides a gloss that lasts for years, provides stain resistance, hydrophobicity, gloss, and creates a dirt-repellency not possible with any other method of protection. Finest Reserve becomes an integral part of your vehicle, sheltering the finish from environmental hazards and allowing it to be washed with ease for years to come! Learn more.